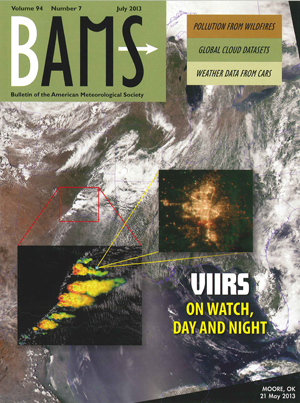 The July issue of BAMS includes a feature on the new and improved imaging capabilities of the Visible Infrared Imaging Radiometer Suite (VIIRS), one of the five instruments aboard the Suomi NPP satellite. The cover montage highlights VIIRS’s expanded spectral aptitude and microscale resolution by depicting three different perspectives on the tornado outbreak that swept across the Midwest on May 20, culminating in detailed nighttime evidence of the track of devastation in Moore, Oklahoma, as detected on May 21. That month, the instruments on Suomi NPP were being calibrated by aircraft that in many cases flew directly under the path of the satellite. On May 20, one of these planes–an ER-2 flying above the cloud cover at approximately 65,000 feet–used the MODIS/ASTER Airborne Simulator (MASTER) to capture images of the storm that brought the EF5 tornado to Moore. 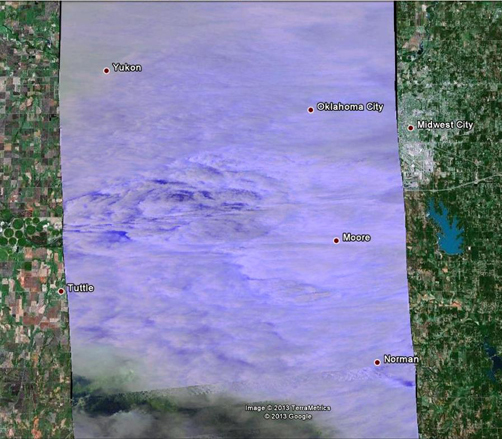 The image below shows the tornado system minutes before it reached the city, and is overlaid on a Google Earth map to show the tornado location.